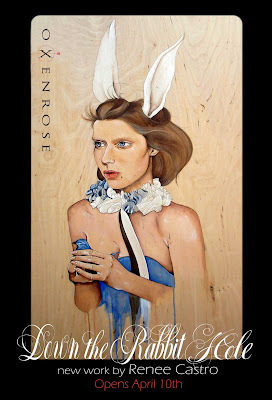 OXENROSE is pleased to present an exhibition of new paintings by Bay Area artist Renee Castro. The upcoming show at Oxenrose will feature Castro's work on many mediums in addition to paper and pen, she has a series of large wooden playing cards inspired by the Queen of Hearts in Alice in Wonderland, delicately drawn pictures against unfinished wood. She will also be completing a live painting during the opening reception and there will be an installation by the artist and long time collaborators April Perez and Chris Granillo.